You are browsing the archive for Georgia Davis Powers. Last semester, I had the opportunity to intern with Elisabeth Jensen, a woman running to be the next Congresswoman of the 6th congressional district, which includes Lexington, Frankfort, and Richmond. 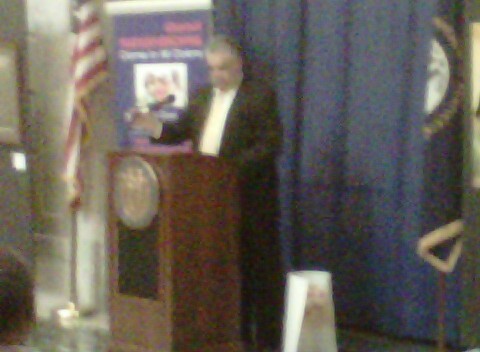 I heard of this opening through the internship coordinator from my summer internship with Congressman John Yarmuth. She had told me about the importance of empowering women in politics and encouraged me to get involved with Elisabeth’s campaign. I knew that this internship would be different from when I worked with Congressman Yarmuth in Louisville, mainly because Elisabeth was new to politics and had decided to enter the race only in May of last year—a few months before I started my internship. She did not have much experience in politics at all; in fact, she had previously worked with Disney and in merchandising. Nonetheless, I could tell that Elisabeth was passionate about running and it seemed that she believed in helping the district. Currently, she is the director and president of Race for Education, a non-profit in Lexington that provides scholarships and educational services for those in financial need. Elisabeth was also a graduate of Emerge Kentucky, a program in Louisville that provides classes and workshops for women interested in running for a political position. Since women are underrepresented in politics, I wanted to know if Elisabeth had dealt with any negativity during the campaign. Interestingly, she explained that the Lexington Democrat community has been very supportive of her and she has not faced any animosity because she is a woman or because of her lack of political experience. She also said she was aware of the feeling towards women in politics and has actually faced more sexism while working in the business world. 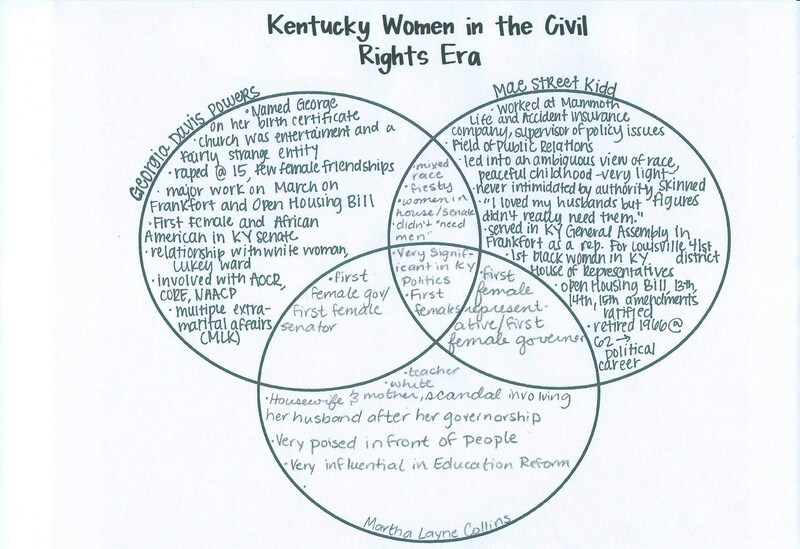 Women in Kentucky politics have been increasing in recent years. Programs like Emerge have been instrumental in training and empowering women to take on government jobs. During the civil rights area, African-American women such as Georgia Davis Powers and Mae Street Kidd were part of the few who dared to go down a predominately white, male-dominated career path in which very few women, or African-American women at that, seemed bold enough to do. 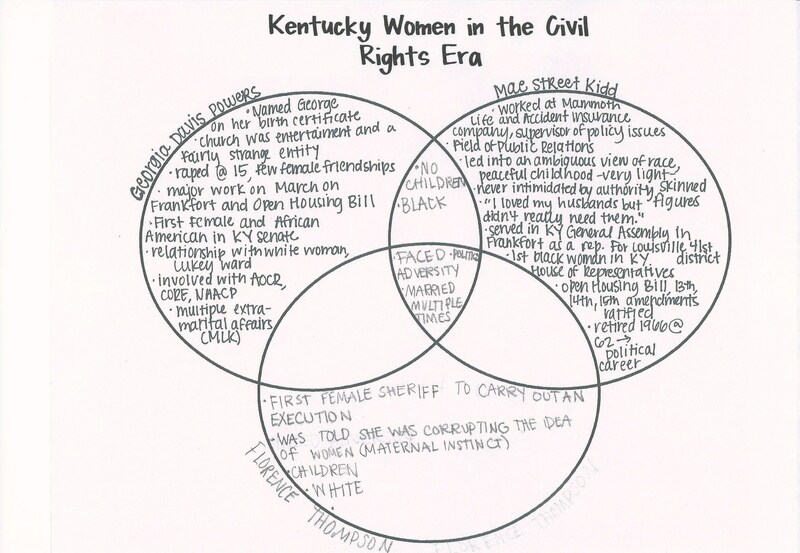 Nonetheless, the charisma these women had certainly helped to influenced the civil rights in Kentucky. Currently, there aren’t very many African-American women in politics, but women such as Governor Martha Layne Collins and Kentucky Secretary of State Alison Lundergan Grimes are representing a new generation that can continue to serve as torchbearers and role models for younger women hoping to one day make an impact in politics. It is interesting that Elisabeth was running with two other Democratic candidates—both of whom dropped out of the race in November of last year—who were men, making her the only woman running on the Democratic ticket for Andy Barr’s position. I think it takes much audacity and strength for her to continue in the race and it is clear that Representative Andy Barr’s experience and expensive campaign certainly won’t scare her away. In terms of the internship itself, I learned a lot about the campaigning side of politics. I think it is probably the toughest part, especially when it is your first election, which makes fundraising a bit more challenging when trying to make a name for yourself. It is helpful that other women before Elisabeth have made the effort less taxing, perhaps providing motivation and encouragement knowing that even African-American women were capable of achieving feats that no one ever thought could be accomplished. Honestly, I wasn’t entirely sure about what to expect in our trip to Frankfort, but I think overall it was an enjoyable trip and a great way to see what we are studying come to life within the rotunda of the capital. 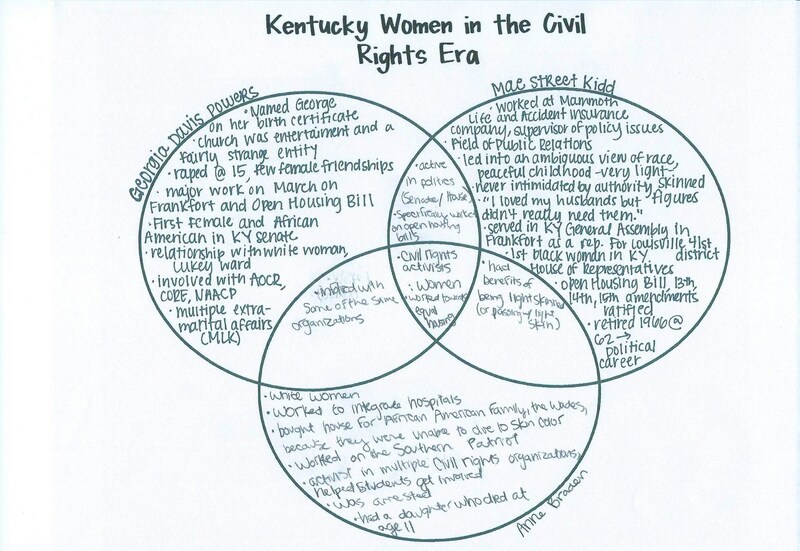 When we first talked to the Commissioner of Kentucky Women, we got a really good glimpse of what the struggle was in Kentucky for powerful women in Kentucky and how it was not uncommon for these amazing women to be overlooked simply because they were women. The exhibit of the portraits of the women and even with the dolls of the women are wonderful tribute to their impact, but even the commissioner called for more; more portraits, statues, and recognition. The proclamation of the 45th anniversary of the fair housing act was also a powerful thing to witness because we were able to see the level of pride that both blacks and whites who have grown up in the fair housing association in Kentucky had for the progress that has been made here in Kentucky. It was also amazing to hear the references of the powerful women that influenced the movement, like Georgia Davis Powers and Mae Street Kidd, completely unprompted. It really made history come alive for me. It also increased my awareness of the impact that woman made in the lives of future generations. 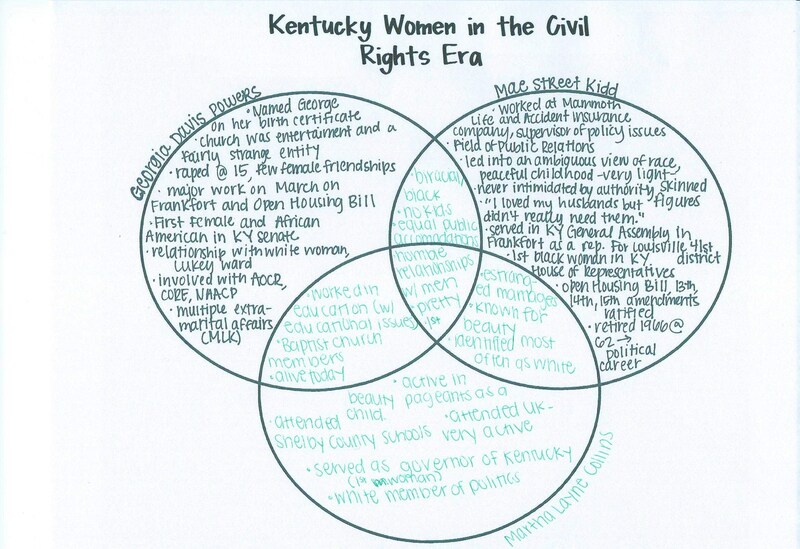 Although we saw that these women were constantly under-appreciated, their impact on Kentucky today is entirely clear. After reading Georgia Davis Powers’ autobiography, I Shared the Dream: The Pride, Passion, and Politics of the First Black Woman Senator from Kentucky, my group led a book discussion on the most important themes and events addressed in the book. Most prominently, my group agreed that Georgia Davis Powers sought to portray herself as a real woman, someone who faces adversity and obstacles and makes conscious choices regarding her life which may not be seen in the public eye. In the book, Powers addresses her life and achievements but also her personal reflections on situations and relationships that had not been published until this book was written. My class has studied numerous influential women in Kentucky during the Civil Rights Movement and was able to draw important similarities between Senator Powers and other major figures. The charts below represent a comparison of Georgia Davis Powers, Mae Street Kidd, and one other prominent figure of the student’s choosing. 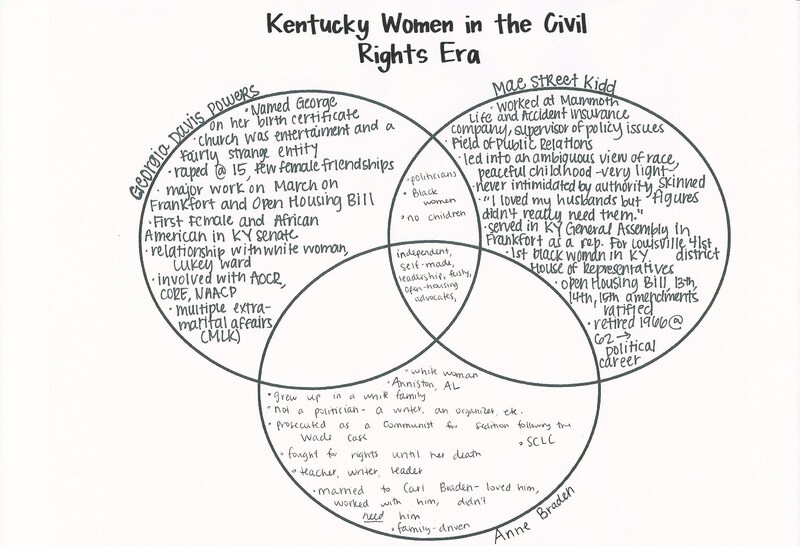 These diagrams intend to show relationships among the female leaders of the Civil Rights Movement in Kentucky as well as highlight key differences in their tactics and methodology. In her book I Shared the Dream (pages 268-271) former Kentucky State Senator Georgia Davis Powers relates an anecdote about her legislative experience. She states that after Federal Judge James Gordon ordered the Jefferson County (Louisville, KY) to begin busing students to integrate schools she had a major argument with then governor Julian Carroll about it. The House members passed a bill prohibiting the use of state funds to purchase the necessary buses. Senator Davis secured enough votes to defeat the bill so the governor contacted her about supporting it. His reasoning, which she believed was not genuine, was to get the federal funds to pay for the added expenses associated with busing. She released those who had pledged to their support telling them to “just vote your conscience.” The bill was passed delaying integration of the district. “Lord, what is it with this bus? When I was growing up in rural Alabama, we weren’t allowed to ride the bus. Rain or shine we had to walk five miles to school, and when the bus carrying the white children passed, we had to scramble up weed-filled banks to keep from having mud splashed all over us. “Then, I moved to Montgomery and Blacks were boycotting the buses, so I still couldn’t ride. Finally, I moved to Louisville where I raised my children and they again walked to school in the neighborhood, even though it was more than a mile- a long walk bad weather. Then, along came the Court order, and they said my children had to ride the bus. They did, and they liked the bus, and got along well at the school they went to. Now, somebody’s trying to turn back the clock and put them off the bus again. Tracy E. K’Meyer, Civil Rights in the Gateway to the South: Louisville, Kentucky 1945-1980. Lexington: The University Press of Kentucky, 2009. See also the television coverage of 1975 street riots in Louisville including members of the Ku Klux Klan protesting the use of busing to facilitate the desegregation of the public schools in Jefferson County, Kentucky.